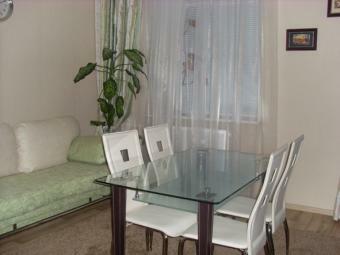 We call your attention to our three-room apartment in the center of Minsk in Y.Kolasa str. 19. We provide you with apartment for daily or long term rent that meet surely those high standards at a very economically favourable price. In comparison with the hotels we have no extra fees for friendlyers renting apartments. We will be glad to help you feel at home during your comfortable stay in Minsk. Our three-room VIP flat is located in the center of Minsk, near subway station �Yakuba Kolosa Square� and Yakuba Kolosa Square, second largest and probably most picturesque square in Minsk. It distinguishes among others in contemporary interior and Western-style. VIP flat is just after redecoration and first time for rent. Our apartment for rent is completely furnished and equiped with all domestic appliances necessary for your comfortable residence: TV, DVD, double-chamber refrigerator, laundry washer. quiet green yard, cab rank, foreign-exchange offices and twenty-four-hour ATM`s, grocery stores and shopping malls, personal services (laundry, clothes repair, footwear repair and so on), drugstores, hairdressing saloons, beauty shops, central markets KOMOROVKA (where you can find fresh cheap meal and surely the most popular Russian dainty - black caviar), �Central Department Store�, trade-exhibition centers �Zerkalo� (�Mirror�), �Parking�, �Olympus�, �Manege�, �Impulse�, modern many-storied guarded car parks �Parking�, a quantity of cozy cafes, tea-rooms, restaurants and bars! Convenient means of transport make our rental apartment easily find. Apartment is on the 3rd floor of a 4h floor building. Building entrance guarded by metal door with digital lock and door intercommunication system. Apartment front door also made of metal and has 2 locks, that why you can feel safe in apartment. Rental apartment has 2 bedrooms, drawing-room with kitchen and bathroom. First bedroom has a high quality couch, coffee table with two armchairs, color TV-set, satellite TV, DVD and radiophone. Second bedroom has a bed, wardrobe and computer table. Wardrobe is in the hall. Bathroom has comfortable bathtub, pan and laundry washer. The kitchen is totally equipped (refrigerator, electric kettle, crockery and so on). There is a table with 4 stools. The flooring is linoleum and carpet. The flat is very cozy and light. It costs 1200 Euro per month for long-term rent (12 months and more) or 100 Euro per day for daily rent.